And just like that, it’s HOLIDAY TIME! 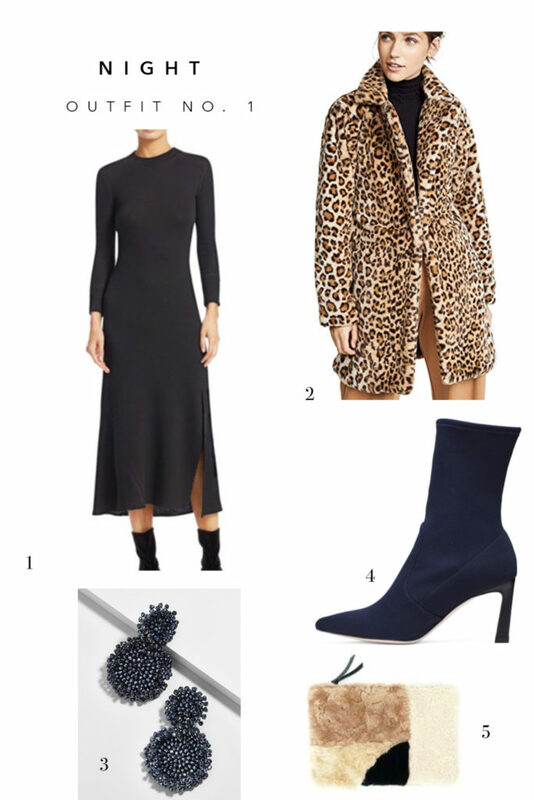 Without question, it is that time of the year where we find ourselves repeatedly reaching for that ever classic little black dress (or as we affectionately call it, LBD). Perhaps it’s the same LBD you reached for last year, which is totally fine! We wholeheartedly believe every fashion gal should have that one black dress that demands frequent re-wears. 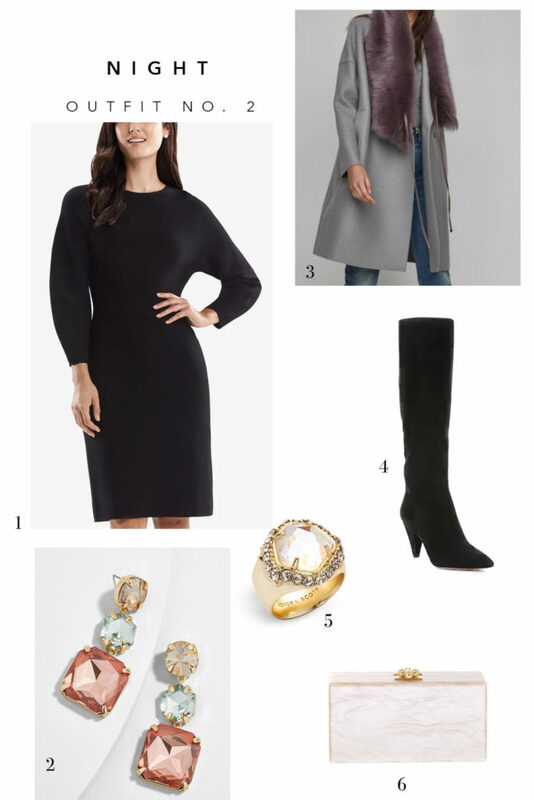 In hopes of inspiring you to get a little extra creative this holiday season, we are sharing a few ways you can REIMAGINE your favorite black dress. You can take it from the workplace or a busy day of scooting around town to a holiday party with minimal effort! It’s all about having the right elements that seamlessly transition from day to night. Now that we have you itching to pull out your LBD, here’s a dose of inspo! A little black dress with a touch of flounce. This LBD style is forever classic and can be styled a variety of ways! What’s all the more special about this particular one from Theory, is the slit that gives an extra touch of leg. For your day ahead, pair it with a unique blazer! To further highlight the blues of the blazer, we opted for this edgy, but feminine navy sock bootie. And lastly, a leopard print hoop earring because animal print is always a good idea. For your evening gathering, continue to play on the animal print trend! This cheetah print coat will allow you to make a statement while keeping warm. 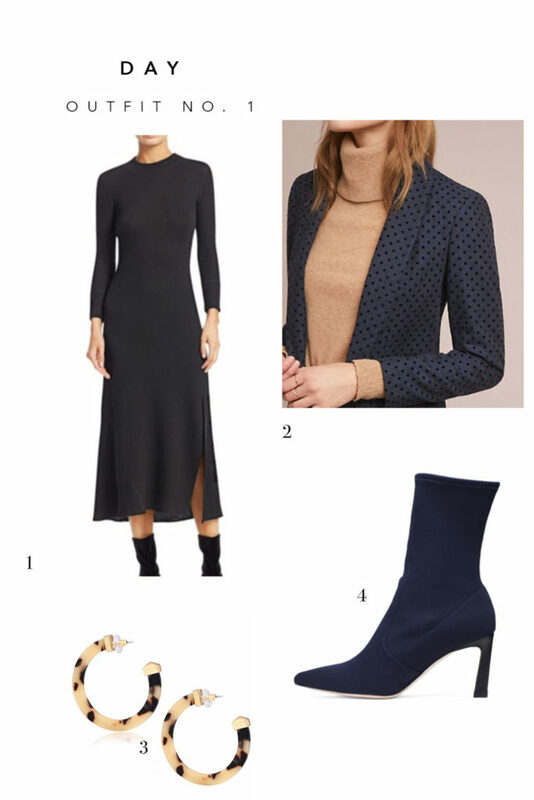 Being practical at heart, keep that navy sock bootie on and do a simple earring change. The Gem Rianne earring from BaubleBar perfectly compliments the bootie. And lastly, pull the entire look together by adding a fun textured clutch! 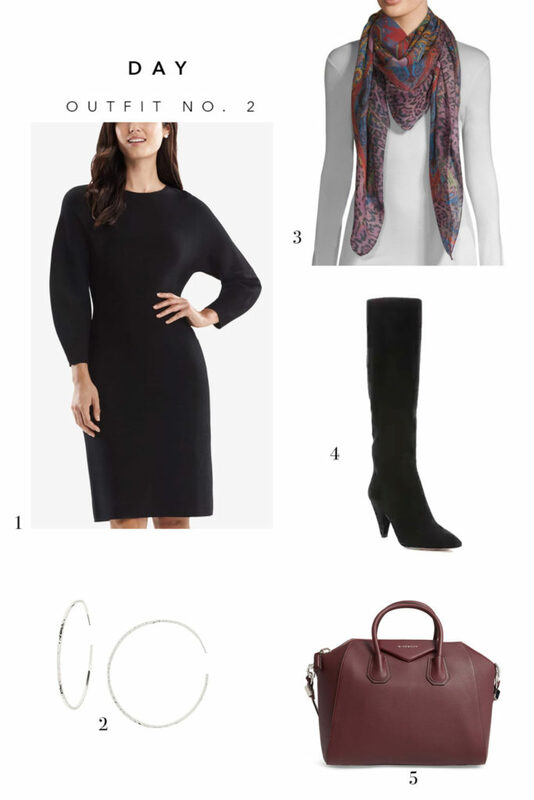 As a gal who spends a good majority of her time in the office, you prefer a bit more of a traditional LBD with a touch of flare to show your personal style! We love the subtle ballon sleeve on this dress which is perfect office chicness. For a daytime look, add a fun printed scarf and a basic hoop earring to go along with it. Oh, and of course a sleek tall black boot with a black opaque tight. To transition this look for your evening holiday soiree, it’s just a simple accessories swap! Swap the printed scarf for a pretty fur shawl like this one from Gushlow and Cole. You can wear this pretty as a shawl or doubled up. From there layer in a sparkly earring, a cocktail ring and a killer clutch. A full day of running to and fro requires a little black dress with movement! We adore this wrap style by 3 Dots! Being a wrap style, this dress is perfect for a variety of body types! For the daytime look, pair this simple, but chic wrap dress with a denim jacket. Finish off the look with a pair Stuart Weitzman’s OTK boots to keep those legs warm and a belt bag! For evening, transition your look by removing your denim jacket and reaching for a moto style. We love this one by Paige, as the removable faux fur collar gives this jacket an extra touch of character! From there, a heeled ankle boot is most definitely the way to go for an evening out. And oh yes, a lariat necklace would make the perfect finishing touch, as it is sophisticated and edgy all at the same time!